Oursainsburys.co.uk is the official Sainsburys employee website. Access the Oursainsburys login page, previously at Mysainsburys.co.uk, to manage your payslips and work hours online. Oursainsburys is also used to keep up-dated on company news, jobs offerings and benefits. Our Sainsburys Payslips and Staff Roster Information. Oursainsburys, sometimes written as Our Sainsburys, is an online portal, which can be accessed by Sainsbury’s employees and colleagues. The service itself provides important details, including roster information and past payslips. It also facilitates easier communication and allows employees to keep up with company news. Prior to its re-branding, the online portal was known as Mysainsburys, or My Sainsburys. The Our Sainsburys platform has an unusual sign up process, because it does not provide an online registration form. 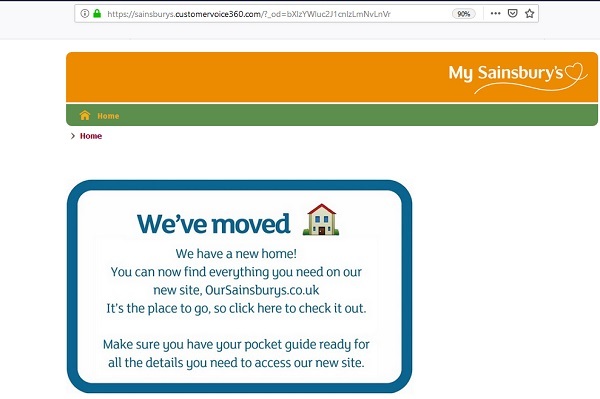 This is a decision that has been made for security reasons, as the employee portal is solely intended for use by Sainsbury’s colleagues, meaning accounts are not available to the general public. Rather than visiting the website and completing a manual sign up process, employees will instead be registered by either their HR department or their manager. In almost all cases, this will occur soon after you start work with Sainsbury’s; typically during your induction phase, when you should be made aware of the online portal. With that being said, a small number of employees do encounter problems here. If you have not been registered for the service, or if you are unsure of your login credentials, you should contact your manager or the HR department. In order to be registered, all users must also have a valid National Insurance number. One thing to be aware of is the fact that the URL for the My Sainsburys and Our Sainsburys portals has changed several times. This can be especially confusing if you are a former employee returning to Sainsburys, or if you are out of the habit of actually using the online employee website for any reason. The old URLs may or may not re-direct to the new site, so to avoid any issues in this area, it is best to update your bookmarks and get into the habit of entering the correct URL into your address bar. While previous versions of the service had their own login forms, the current system makes use of a Microsoft login page. The old Mysainsburys.co.uk now points you to Oursainsburys.co.uk. How do I log in to my Oursainsburys/Mysainsburys account? Oursainsburys accounts are created by the HR department and all login credentials follow the same basic format. The username will resemble an email address and will be made up of your first name, last name, and last four digits of your Employee ID. Meanwhile, your password will be your National Insurance Number, with no spaces, and with the first letter being upper case. After signing in for the first time, it is recommended to change your password. An example of your valid Oursainsburys Username is: firstname.surname.last4digitsofouremployeenumber@mysainsburys.co.uk (for example: john.smith.3456@mysainsburys.co.uk). If you are unsure of your credentials, you should speak to the HR department, or your manager. Once you are aware of your login credentials, you can sign in to the employee portal by going to: https://www.oursainsburys.co.uk/ here. After the page loads, you should see a Microsoft Outlook based login form, with a field marked ‘Email, phone or Skype’. In that field, enter your username, then click on the ‘Next’ button. Then, enter your password and click the ‘Sign In’ button. Some employees have reported issues with accounts becoming locked, seemingly without cause. If this applies to you, the advice is to call the DT Service Desk on 0345 603 2282. Once you connect with the automated answering system, choose option number eight and you should be put through to someone who can assist you with this. 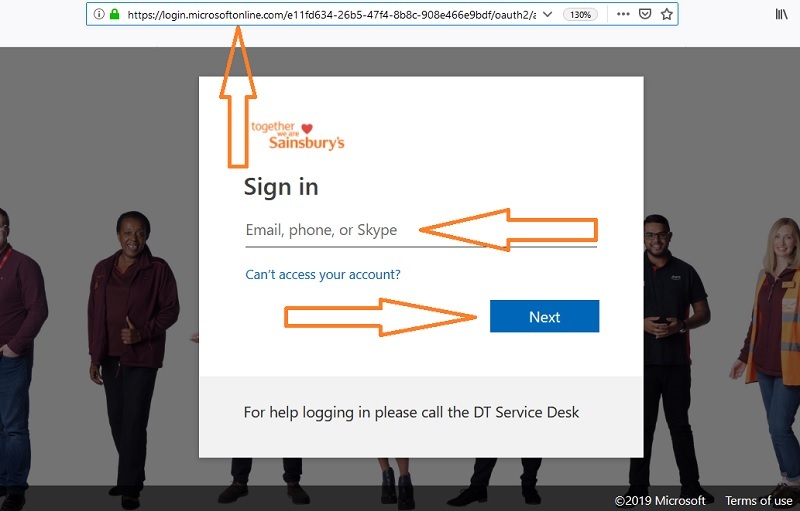 The Mysainsburys or Oursainsburys login page is now a Microsoft Outlook Sign In page. From time to time, Sainsbury’s employees may encounter difficulties when attempting to sign in to their account. However, in almost all cases, there is a fairly simple solution. If you are unsure of the precise cause, the best advice is to work through the following troubleshooting tips. The most obvious potential problem is that you are using the wrong URL, so make sure your bookmarks have been updated, or that you are entering the right address into your web browser. If the page still fails to load, you may have a problem with your internet connection, so check it is working by trying to load a different site. If you continue to have problems even loading the page, you should make sure your web browser is updated to the latest version. It may also be worth temporarily disabling any ad-blocking software you have installed. For users who have managed to load the login page, but are unable to actually log in, the most common problem is incorrect login credentials. Make sure you are entering your username and password correctly and check that there are no typing errors before trying to sign in. Your username should resemble an email address and you need to enter the prefix, ‘@’ symbol and suffix. Your password is case sensitive, so turn CAPS LOCK off. As with any service of this type, it is inevitable that some users will forget either their username or their password. If this applies to you, the service includes a built-in username and password recovery system. Go to the main login screen and click on ‘Can’t Access Your Account?’ – then simply follow the steps outlined on-screen. If you continue to have problems, it might be worth attempting to sign in using a different web browser, or a different device, such as a mobile, tablet or laptop. It should be possible to sign in using all mainstream web browsers, including Chrome, Firefox, Edge, Internet Explorer and Opera. Finally, if all else fails, employees are advised to call the Sainsburys DT Service Desk on 0345 603 2282. While the employee portal serves a number of different functions, the main reasons employees tend to log in are because they want to view payslips or want to see staff roster information. Fortunately, both of these options are easy to find. Simply log in to your account and use the navigation menu to go to the relevant section. 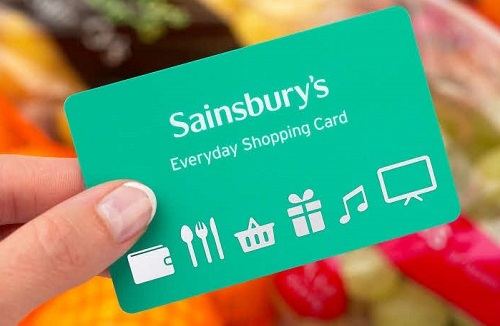 After 12 weeks’ worth of service, employees become eligible for employee discounts, which amount to a 10 percent discount for colleagues in Sainsbury’s supermarkets, as well as Argos stores. Meanwhile, for colleagues working in a Habitat store, the employee discount is an even more generous 25 percent. In all cases, a second named person can be chosen and they too can benefit from the discount. Use your Oursainsburys card to get a 10% employee discount. Sainsbury’s is a major retail company, based in the United Kingdom, which primarily operates supermarkets. Indeed, with a market share of more than 15 percent, it is the country’s second-largest company of its type. The supermarkets sell various convenience items, including food, clothing, electronics and personal care products. Many Sainsbury’s supermarkets are connected to a petrol station and contain a café. Moreover, the company also owns Sainsbury’s Bank, as well as the popular catalogue retail chain, Argos, and the furniture chain, Habitat. For further help and questions about Oursainsburys.co.uk, please refer to the comment section. Thanks for the help, it cleared things up for me.